10 months ago Cut was too different from usual... too short in body. I own your regular blazer and a couple of suits. The fit was just off. 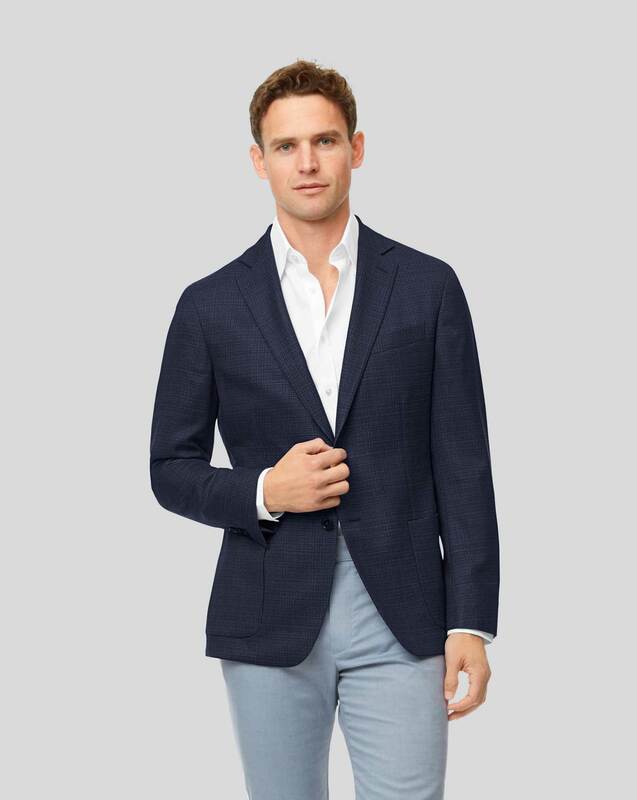 Response from Charles Tyrwhitt: It's certainly a shame this gorgeous blazer wasn't quite the right fit for you in a Slim Fit. I understand your previous purchases were for Classic Fit, so this slimmer cut will feel quite a bit different. Hopefully, you will be able to find a Classic Fit blazer to suit you and keep you looking sharp! 149 lbs, and i am 5' 10"
Response from Charles Tyrwhitt: I'm happy you made an order for this wonderful blazer. I'm sorry it didn't fit as you expected but I'm glad you have sent it back to us for an exchange. Once we do receive this blazer we will send you a confirmation email that it has arrived back and when the replacement will be sent to you. 11 months ago I was disappointed with the body fit. I typically buy a CT 36 slim jacket. I tracked this item for months until it finally became eligible for discount. Be aware the jack is unstructured and is half canvassed. It fits very loose and casual. The fabric itself is nice; it is light weight and extremely breathable for temperatures in the 90s (fahrenheit). I am worried the amount of tailoring needed to make a truly polished jacket will be expensive and makes the total cost of ownership less than worthwhile. Response from Charles Tyrwhitt: Here at Charles Tyrwhitt we appreciate the importance of a perfect fitting garment - in fact in our opinion this is one of the most important things to accomplish! I am sorry to hear that the Travel Blazer was not as suitable fit for you as previous jackets. It is very odd that you have found our jackets and blazers to be inconsistently sized across our range. There may be a slight discrepancy due to different suppliers but this would be subtle and certainly should not alter which size is needed. We would of course love for you to absolutely adore every item in your wardrobe, so you are of course more than welcome to exchange this item for something more suited to you, or return with our no quibble 6 month guarantee. I have noticed in your account that you have previously purchased jackets in a short fit, which would be slightly more fitted so perhaps a better choice to consider. I thank you for your feedback, we always appreciate hearing from customers so that we can continue to improve. I hope that I have been able to recommend a solution for you so that you can continue to enjoy our Charles Tyrwhitt products.